Even with the most basic of all siege weapons, the ballista, a specialist workshop is required to produce the great euthytones, the oversized wooden bows that give the ballista their power. 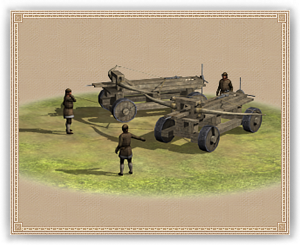 Though the ballista are assembled here, their crews are trained outside of the city walls – The only safe place to master the use of such equipment. Dwarven siege workshops are most productive in mountain regions.